Your Beer Pong skills are practically non-existent. Despite your efforts, you always seem to find yourself at the wrong end of a nasty cup of the cheap booze that nobody else wanted, while your opponent remains virtually sober at the other end of the table. How can you you improve your chances of winning? Do you practice your wrist movements? Take tactical 'fake sips' from your drink before the game to ensure that your friends are already more drunk than you are? Perhaps the answer is simple: More cups! Now with our 50 Pack of American Style Red Solo Cups, you can massively improve your chances of scoring, even after a few drinks. We also have a pack of 50 Blue Solo Cups, making it easy to set up opposing teams. Of course, you'll have to make sure that you get enough alcohol to fill the extra cups, or more friends to help you get through it. Imagine yourself in a crowded room, your friends are cheering you on. All you have to do is sink this little white ball into one of the opposite cups. You take a deep breath and throw, but the pressure is just too much, you've botched it! The ball shoots across the room, bouncing between the legs of your spectators on its journey. You look in horror as it rolls smoothly into the cobweb ridden, stale crumb infested abyss of your kitchen. It's game over. Don't let this happen to you! 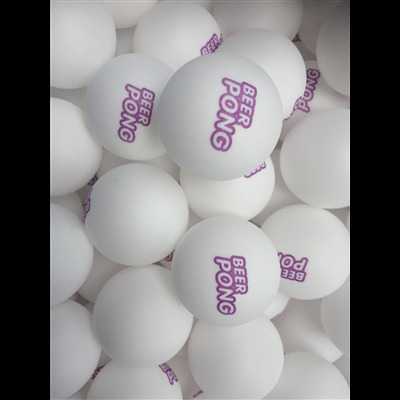 With our pack of 5 Beer Pong Balls, you can ensure that one rogue ball doesn't spell the end for your Beer Pong fun. No need to worry about crawling on your hands and knees in a pitiful attempt to salvage your game. With this 5 pack, you're sure to have enough back-up balls to see your through the night. 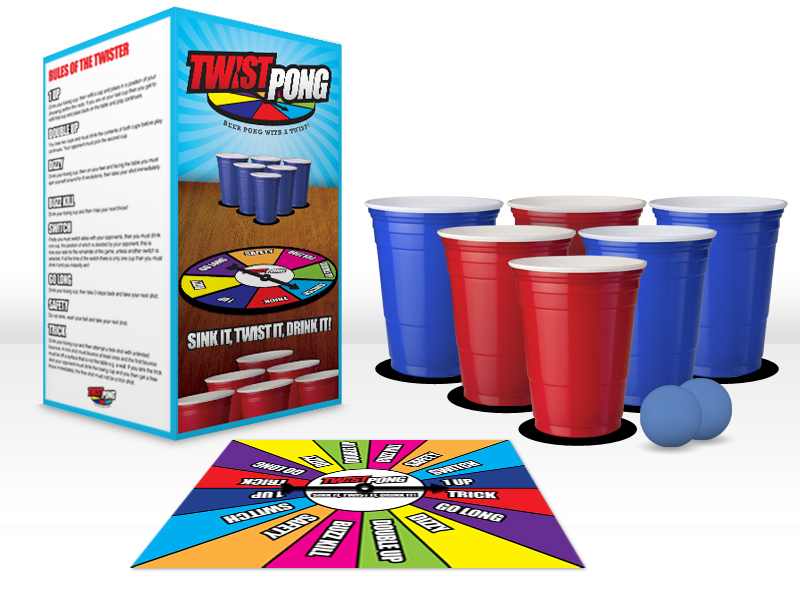 Four terrific twists on the party classic - beer pong will never be the same! If you're a big fan of beer pong, we've got some rather good news for you. We've added not one, not two, but FOUR brand new beer pong games to our website, and each one is a bigger barrel o' laughs than you can possibly imagine. 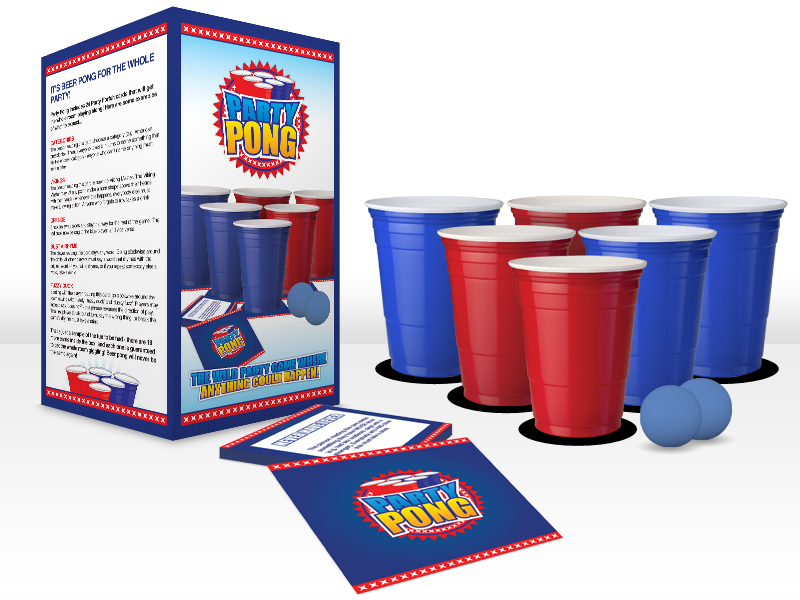 Party pong is a beer pong game that your whole party can play! Anyone hoping to sit quietly on the sidelines while the others take care of business is out of luck - this game will get everybody involved, with mini-games, challenges, forfeits, and naturally, a whole lot of drinking! If you're looking for a fresh twist on traditional beer pong rules, the aptly-named Twist Pong may be just what you're looking for! Every lost cup results in a spin of the spinner, the results of which could be completely game-changing! Twist Pong will keep you on your toes until the very last shot. 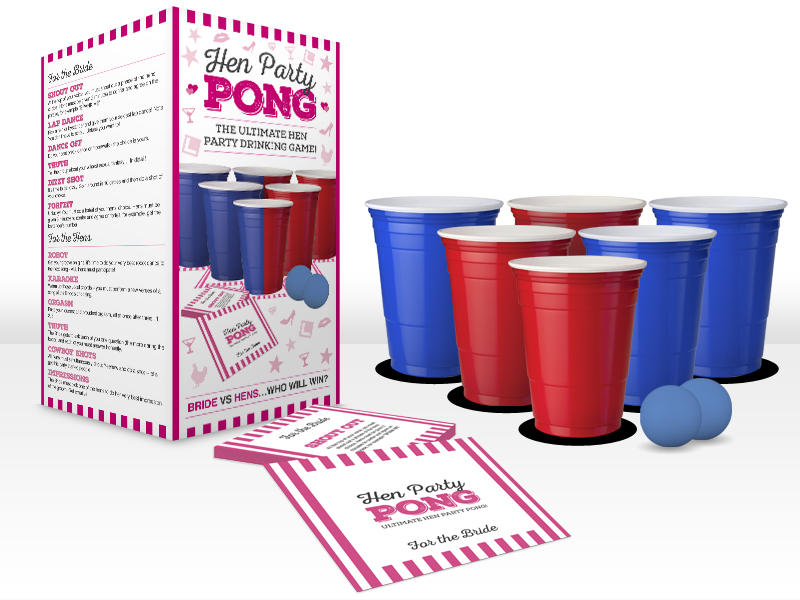 There ain't no party like a bachelorette party, and this particular pong set is perfect for those rowdy nights out (or in!) with the girls. The game comes with 6 dares for the bride, and 6 for everybody else at the party - we won't tell you exactly what the cards say, but rest assured that they're all rather naughty! And speaking of naughty, our fourth and final pong set is the naughtiest of them all! 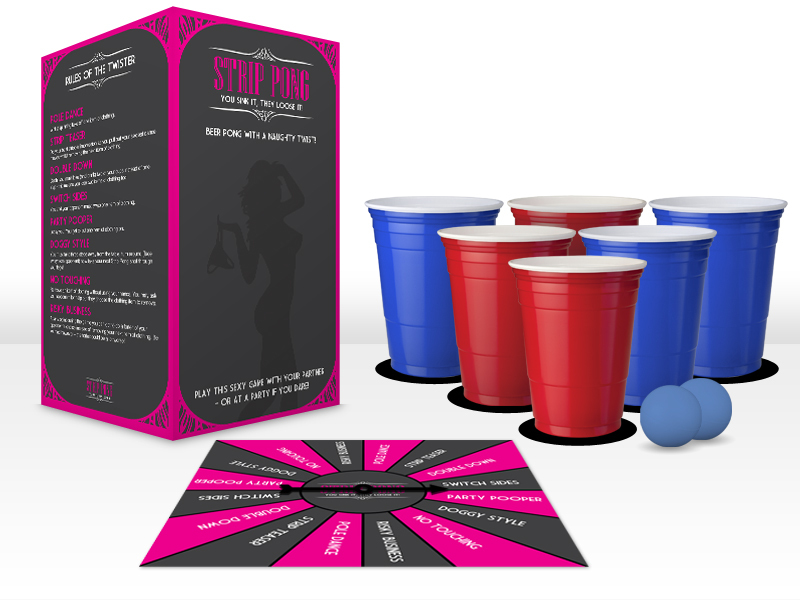 Strip Pong is exactly what it sounds like: a steamy spin on beer pong that will have you taking off your clothes while you get squiffy! Thirsty for more? Check out our Beer Pong department to see our full range of beer pong products! Our New Range of Beer Pong Merchandise! Here at Beer Bong UK we specialise in all things beer bong related - unsurprisingly, but we also dedicate a lot of time to the very serious, very professional and highly esteemed sport that is Beer Pong. That's right, we are advocates of beer pong and take the game extremely seriously, striving to offer only the best beer pong accessories that money can buy. If you take your beer pong seriously like we do, have a mean ping pong ball throwing arm and consider yourself well equipped with the ol' red solo cups then we think you need to own your talent, step up to the mark and let everyone know who's the beer pong boss. That's why we've released a range of exclusive beer pong merchandise for you to get you ready for your beer pong tournament. Here are 3 of our favourite beer pong clothing items from our new beer pong merchandise range. This beer pong hoodie is for the serious contenders. Wearing the proud 'Beer Pong Champion' logo across your chest with the image of those notorious red solo cups. Rocking this hooded jumper for your impending beer pong game will make sure all your opponents know who's boss. This Beer Pong Princess T-Shirt is one for the ladies, showing those guys that girls can pack a beer pong punch too! Wearing this t-shirt will ensure that everyone knows you're not just a pretty face, and though you might be as cute as a princess - you can certainly own the beer pong table. Our Red Team Beer Pong T-Shirt is the ultimate in beer pong merchandise if you're playing in teams. Your whole team should be kitted out in these t-shirts, letting everyone know the red team is who's boss. If Alternatively, if you're playing a solo match against a friend you can rock this red team t-shirt, and your fearful opponent can wear our Blue Team Beer Pong T-Shirt! Lads and lasses, ladies and gents, it's a pleasure to welcome you back! This week we're keen to delve into the mysterious (and awesome) world of Beer Pong once more - but in a lot more depth. That's right guys - we've already showed you the basics in our handy Beer Pong for Beginners Guide found here, which will tell you everything you need to know to get yourself acquainted with Beer Pong: the party game that will change your life. Now if you're a seasoned Beer Pong player, or if in the style of Pringles - you've had a pop and you just can't nor do you want to stop and you're dying to scratch that itch and satisfy your cravings then folks, you have undoubtedly come to the right place. Here we consider Beer Pong a sport of the highest order, and in this blog post we'll be bringing you the extreme rules - the rules that will turn this light-hearted game into a battle to the death drunk. These rules allow Beer Pong to become the competition it was destined to be - folks, it's time to bring out the big guns. Follow these rules for Extreme Beer Pong - taking your game of Beer Pong to the next level. This means no elbows are allowed to touch the Beer Pong table or anywhere near it. You shoot with your elbows behind the table. Any elbows will result in a drinking penalty, or if you're feeling harsh - the removal of one of the offending team's cups from the table. The same as the elbow rule - but much, much harder. This rule means you shoot with your wrists behind the table, making the opposing targets even further away. This rule is only for the most seasoned of players - this makes Beer Pong pretty hard. Up to three times in any game each team can request for the opposing team's cups to be re-racked. This means you move the cups into some sort of formation where they're touching, rather than leaving lots of gaps. We might argue that this occasionally makes the game easier, but these are Beer Pong rules for you to use at your disposal, so use them wisely young grasshoppers. If you bounce a ball and it makes it into a cup - either accidentally or otherwise, this is a trick shot and means you can remove the cup which the ball bounced into and one other cup of your choice. If your ball hits the rim and bounces out, without landing in a cup then we have a competition on our hands. A dirty pint is created and you are challenged to either hit the rim again or get the ball in the cup - if you manage it the other team shares the dirty pint, if you don't then bottoms up my friend! If you notice a "lonely" cup - which means one cup which is separated from the rest on the table, you can call it and attempt to hit it. If you miss or you hit another cup then your shot is invalid and you lose a cup of the opposition's choosing, if you hit it then that cup and another of your choice can be removed from the table. If a ball is rolling around the cup or the rim, or is not settling in the cup then no blowing or pushing the ball is allowed. If anyone attempts to intercept the ball or cheat then you lose a cup. You must all wait patiently, for Beer Pong is not a game to be rushed. Once one team has one, there could well be a number of other cups left on the table. Play these cups one by one - if you miss, you drink a shot, if you get it then you get to nominate another player of your choice to drink a shot. The beauty of Beer Pong is that you can make as many exotic and exciting rules as you wish. You might want to adopt a no swearing rule - offering a free shot to the opposing team whenever someone swears? The Beer Pong rule options are literally endless. Just remember: this is not a game for babies - you need to take it seriously, and play as if your life depended on it! What's that? You’ve never played beer pong before? Don’t worry – we’d be more than happy to show you the ropes! It’s pretty straightforward, and once you know how to do it, you can teach your friends and organise a tournament! Give each player a ping-pong ball, and you’re ready to start! Players take it in turns to throw their ball at the other player’s cups; if the ball lands in one of your cups, you have to drink that cup’s contents. The first player to drain all six cups is the loser! Each player has a separate drink set aside from the pong table. If you miss a throw (i.e. if your ball doesn’t land in a cup), you have to take a swig from your own drink! The losing player has to perform a forfeit, as chosen by the winner. Give each cup a number, and stipulate that each player must hit his opponent’s cups in the correct order (1-6). If a ball lands in the wrong cup, the thrower must perform a forfeit.